There is absolutely no evidence for the pleasing image of George William Suter experiencing a change of heart after pausing outside one of the brightly lit West End shops in December 1918 and imagining his name on the canopy above. Nevertheless, the Decade which followed the end of the Great War witnessed a transformation in his life and an expansion in the mental horizons and expectations of his entire family. Within nine years of the armistice, George William was well established in a comfortable middle class family home in Buckinghamshire and was in partnership with three of his sons in a new family business with shops in both Slough and Uxbridge. His fourth son had been dispatched to start an appropriate apprenticeship before joining the firm and the family were aiming to establish multi department stores in both its chosen towns. Yet it had all started, inauspiciously, in 1917, with a decision to sell up in Ledbury and retire to cultivate cabbages in Golders Green. While the three years from September 1917 to September 1920 were eventful so far as George William Suter and his family they have left very little by way of record. 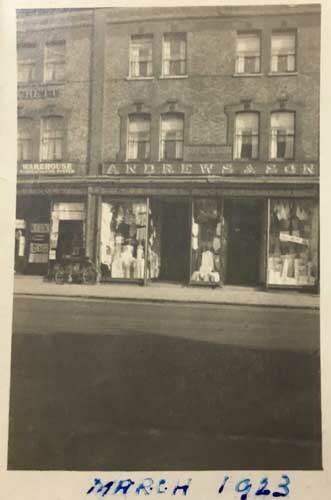 (2) moved with Elizabeth and John to The Ridgeway, Golders Green, (3) taken a job with a firm of wholesalers in the City of London, (4) given up the job, bought a new business in North London and moved there with his family (5) sustained a loss due to a failure to insure his stock (6) sold the New Southgate business and moved back to Ledbury and (7) formed the new partnership with Clarence which found and took over the lease of the Slough shop. What did George William think he was up to and how did his long suffering wife ever put up with it!. Retiring from business in 1918, he was unable to reconcile retirement with his previous active life, and, in 1920, he started again. - Slough Observer Friday July 19th 1946. I may get leave about the 18th inst. or so, but as you are going to London about that date I will postpone it until the end of the month, that is if I can get it, but they might give me draft leave instead. - Arthur Suter - Blandford 8th February 1918. A Field Service Post Card dated October 12th 1918 is addressed to "Mrs Suter, 121 The Ridgeway, Golders Green confirming that the move had been completed by that date. George William was only 51 which is early to retire unless there is a special reason for doing so. It is easy to imagine that stock would have been low in the autumn of 1917 when a victorious end of the war was hardly in sight. It may be that he did not relish committing additional capital in Ledbury when the future was uncertain. There was a boom for a year or so immediately after the Armistice but it looks as if the decision to sell up was made well before then. George William had lost shop assistants as the war progressed and it can not have been easy trying to run the business without reliable help. George William may have been tired of managing a business on his own and fed up with life in a small country town. Whatever the reasons the shop was sold towards the end of 1917, and Bank House was to be put on the market, as soon as the current Lease came to an end in 1919. While John did not say when the move from Golders Green to New Southgate took place there is, however, evidence that the family was still based at 121 The Ridgeway in March 1919. A faded photo survives (fig 5.01) which is annotated on the back "How the Suter family spends Sunday afternoons at 121, The Ridgeway, Golders Green - John, Clarence, Arthur, Father - Sunday afternoon, March 16th 1919". 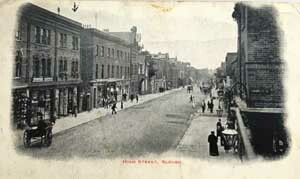 The implication is that a 'retired' life in Golders Green on Sundays was so quiet as to be boring. This does not, necessarily, mean that a new business was not in prospect . The contrast may simply have been with the previous five years which had been eventful enough! It is not clear to whom the photo was sent. The notes on the back could be in Arthur's writing and it was preserved in George Suter's collection. The move to New Southgate must have happened some time in the Spring or early Summer of 1919. The family were installed there in time for the Victory celebrations in July. 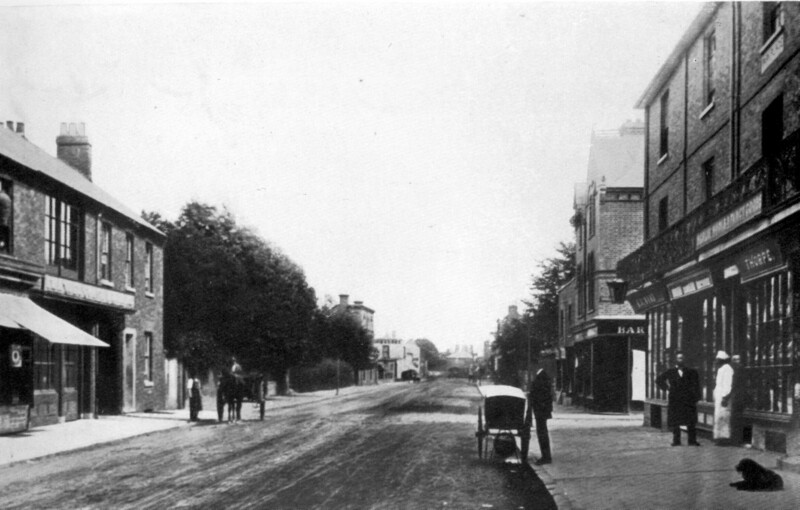 Thus, within about eighteen months, George William moved to his new house in The Ridgeway, Golders Green, contemplated life without the shop, decided he did not like it, obtained a job in the City, decided he did not like that, bought another business in New Southgate and moved to the flat over the new shop having packed John off to Colet Court. It was a great deal to fit into one year and one wonders if he really intended to retire in the first place. The actions taken on their own seem to accord more closely with those of a man who had decided to sell up in Ledbury but had, at least, half a mind to look around for something else when he was settled in London. George William may have felt that it was time to move away from Ledbury and that he could always consider his options after the war had ended In 1917 he could not know how long the war would last and he may have felt that trading conditions would get a great deal worse before they improved again. But if these were George William's thoughts he did he not share them with his family. Perhaps, he was not sure and wished to avoid losing face. Elizabeth may have been attracted to the idea of a life without the shop and perhaps, also, it was easiest to tell family and friends that he was going to retire and then be prepared astonish them if it seemed worthwhile starting up again. In any event, he did not stick with the quiet life for long! 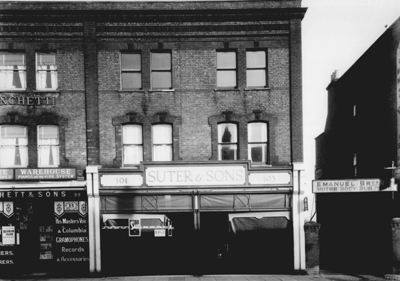 The new business was at 107/109 Friern Barnet Road, New Southgate in North London and included a funeral department. Living space was limited - hence the need for John to board at Colet Court. He would have started there in either the Summer or Autumn term and it would have come as a big change for him. Colet Court was a large school with just under 500 pupils. There is school photograph taken in 1919 (unfortunately very large and framed so as to make it difficult to copy) which includes John. The comments in John's 'Autobiography' imply that there was not a great deal of living space at the new house - why otherwise was it necessary for him to be sent away to school - and it may be that space was not particularly important. Arthur and Clarence were out of the forces but Arthur, at any rate is likely to have been living away from home. He returned to his pre-war job though as part of a much larger concern. Welford's Surrey Dairies was now part of United Dairies. Arthur's story will be told in Chapter 7. Frank who had been a boarder at Whitgift was also about to leave and start his engineering apprenticeship in the Midlands. Two portraits show Winifred at about this time. The first (fig 5.02 above left) is undated but the second (above right fig 5.03), which is in the form of a post card with an impressed stamp 'P. Ward, 147 Strand, London W.', has a note on the back 'Taken Dec 9th 1918'. Clarence left the army with an injured arm and an undisturbed ambition to take up where he had been forced to break off at the end of his apprenticeship in 1914. He found a job with E & R Garrould who were linen merchants and drapers of Edgware Road and lived in at the Edgware Road shop. Any members of George William's family who were in London are likely to have witnessed at least some of the celebrations which accompanied the signing of a Peace Treaty at Versailles at the end of June 1919. There were tea parties in London streets and a Great Victory March Past on the 19th July. Sir Douglas Haig rode at the head of the troops saluting the King on a dais erected at the Victoria Memorial in front of Buckingham Palace and crowds lined the streets and bridges to watch the troops, including a large contingent from the American army, march past. Clarence remembered the day of the Victory March Past because it was the day he met Maud Beavis. 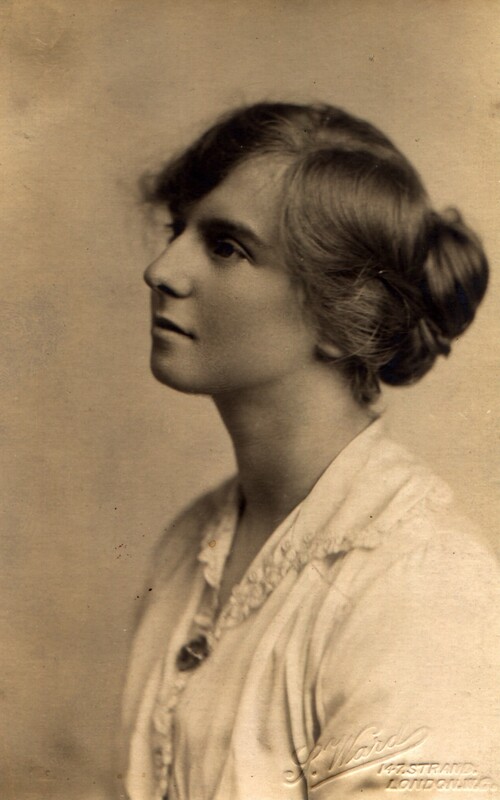 Maud's mother who was a customer of George William's new shop in Friern Barnet Road lived with daughters, close by, at 5, Glenthorne Road, Friern Barnet and Maud and Clarence were first introduced on "Victory Day". They fairly soon reached an "understanding" which was accepted both by her mother and Clarence's parents though the wedding had to await his future "business success". Newspapers published special editions celebrating the Peace. Arthur bought and preserved the Daily Mail 'Golden Peace Number' of 30th June 1919. Like so many returning servicemen, he found that Lloyd George's promise of a 'land fit for heroes' had a somewhat hollow ring. Clarence had money saved, and like all the children, was due to receive a substantial legacy from his Aunt Denning. On leaving the army it seemed that he was in competition with the whole world and he realised he must get a job on almost any terms. Nevertheless his intention remained to start up on his own as a draper as soon as a suitable opportunity arose. He began to look around, discussed his plans with his father, and before long had been commissioned to find a shop which would suit them both. 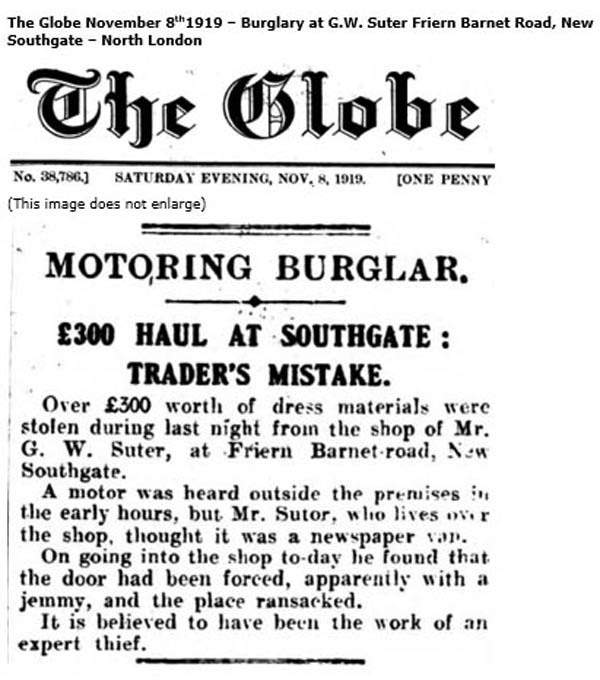 George William was not long in New Southgate before his business suffered a blow when a burglary led to a loss of uninsured stock. According to family tradition, Elizabeth was less than impressed and the consequent family friction may have convinced George William that if he was going to return to business it should be in partnership with someone he could rely on and who would look after the office work. He decided to sell up for a second time, get out of New Southgate and put his money into a new shop which he could run with Clarence. Bank House was still available if a temporary home was needed. 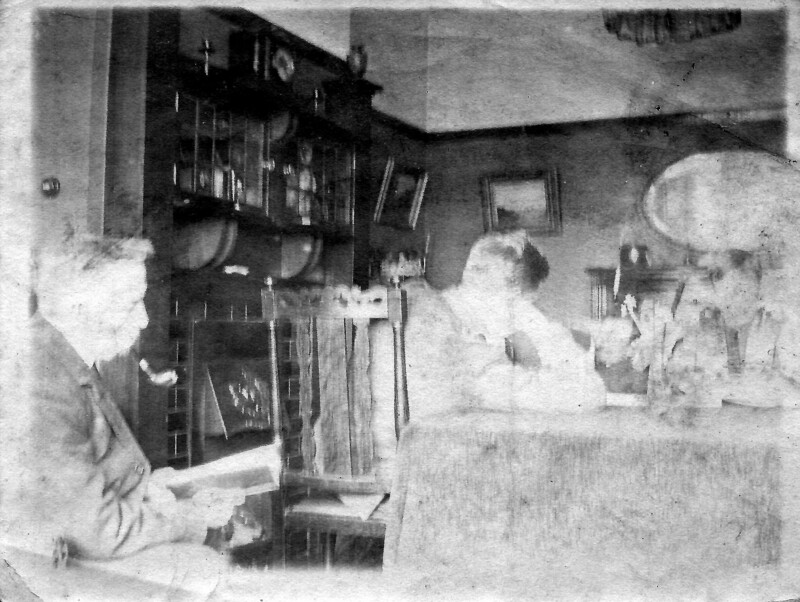 It was at this stage that he began to discuss his plans with Clarence and father and son agreed to embark on a new venture in partnership. Preparatory School, Hammersmith, West London, and in 1921 to St Paul's School, West Kensington, …….. Meanwhile, my father ……… had a burglary and a lot of stock was stolen, again misfortune, he was not insured, the money loss affected and annoyed my mother with the result that he eventually sold the business and we moved back to Bank House in Ledbury, the house where my brothers Clarence, Frank and my sister, Win, were born. Arthur had been born over the High Street shop earlier. As noted by John, the business finally chosen by Clarence for the new father and son firm was in Slough - a small residential town west of London where an ugly war time motor repair depot had been constructed on nearby farm land and, being no longer required, was about to be transformed into the Slough Trading Estate. By the reign of William IV, between sixty and eighty coaches passed through the town daily, over 1,000 horses being stabled here for their use. 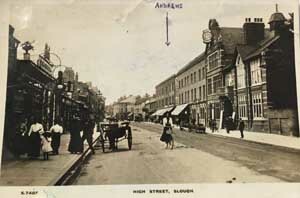 The Georgian era was one of the most brilliant periods of Slough's history, and many celebrities, and even royalties, were numbered among the town's visitors. Maxwell Fraser - Borough of Slough Official Souvenir - 14th September 1938. Apart from being a place to change horses, the Slough's principal claims to fame in the eighteenth century were the Eton 'Montem' held, from the fifteenth century onwards, at Salt Hill beside the Great West Road (now a public park and recreation ground either side of the Bath Road) and, during the reign of George III, the presence of the King's Astronomer. The Montem was a triennial 'procession' of boys from Eton College the object of which was to extort money for the benefit of the senior scholar on the foundation before he left Eton for Cambridge. It developed into a mock military procession of boys dressed in fanciful uniforms and, as communications improved, attracted progressively larger crowds of spectators and contributors. Queen Victoria attended in the year following her accession in 1838. All spectators and passengers passing along the road and though the neighbourhood were expected to contribute. Sir William Herschell settled in Slough at Observatory House in Windsor Road towards the end of the eighteenth century on his appointment as the King's Astronomer at Windsor. Once comfortably settled close to Windsor in a quiet community relatively free from the smoke laden air and bright lights of London Sir William constructed and in 1789 erected in the garden a large reflecting telescope. The work was finished on 28th August 1789 and on that day he discovered with it the sixth satellite of Saturn. His most important discovery while in Slough was that the stars are subject to gravity. Sir William died in 1822 and was buried beneath the tower in St. Laurence's Church, Upton. The passage of the Bill through Parliament was achieved in the face of strong opposition and difficulties created by a vigorous objection from Eton College. Though they failed to prevent the passing of the Bill and the building of the main line, Eton managed to get inserted a clause precluding the Company from constructing a station or depot within three miles of the College without the consent of the Provost and Fellows whose attitude was that no public good could possibly come out of such an undertaking. The clause which protected the scholars of Eton from the evils of the new railway also deprived Slough of a railway station. This did not concern the College who, despite their objection to a station, were happy to arrange with the railway company for a special train to take scholars up to London to see the Coronation. Fortunately the Company had no wish to deprive Slough of the use of its railway and, when the railway opened in 1838, it was arranged that trains would stop at Slough in order to pick up passengers waiting beside the line. The appeal was dismissed, the opposition from Eton College ended and Slough was provided with a railway station in time for the Queen to take her first train ride in 1842. A branch line to Windsor was built in 1849. Thereafter, the town began to develop as a place to live within easy reach of London due to the excellent Great Western service. In 1882 a new and very much larger station building was opened. As can be seen from the photo of the original station, it was unusual in that both the 'up' and 'down' platforms were on the same, south, side of the track. 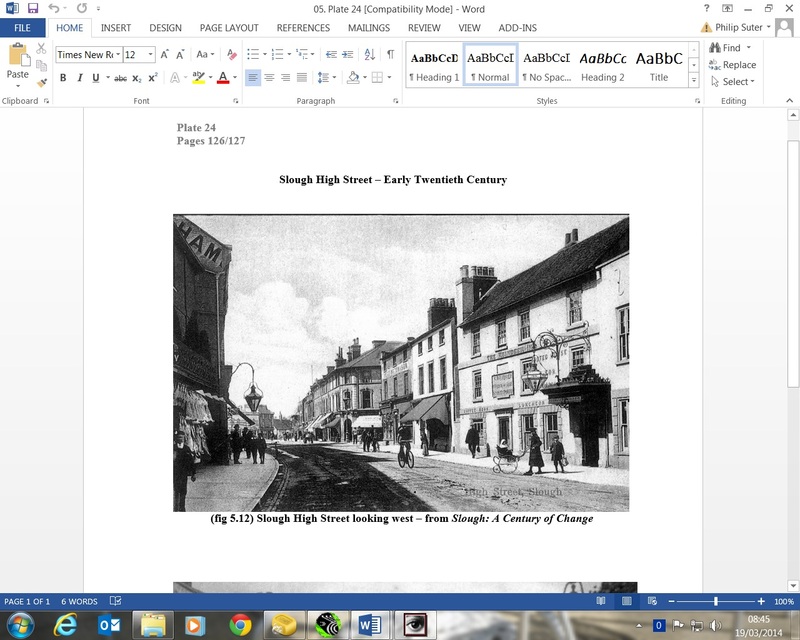 A photograph included in the 1938 Official Souvenir (fig 5.10 above) shows a very peaceful High Street a decade or so before the end of the nineteenth century. The belt of trees on the left hand side of the road marks an area of vacant land upon which a new parade of shops was subsequently erected. One of these became occupied by the drapers business which attracted the interest Clarence and his father soon after the end of the Great War. 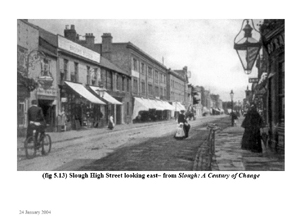 By the end of the last decade of the nineteenth century the population of Slough had risen to 7,400 and in 1900 the Urban District was extended from 563 acres to 1,684 acres with a consequent increase in the population 11,450 person living in 2,567 dwelling-houses. 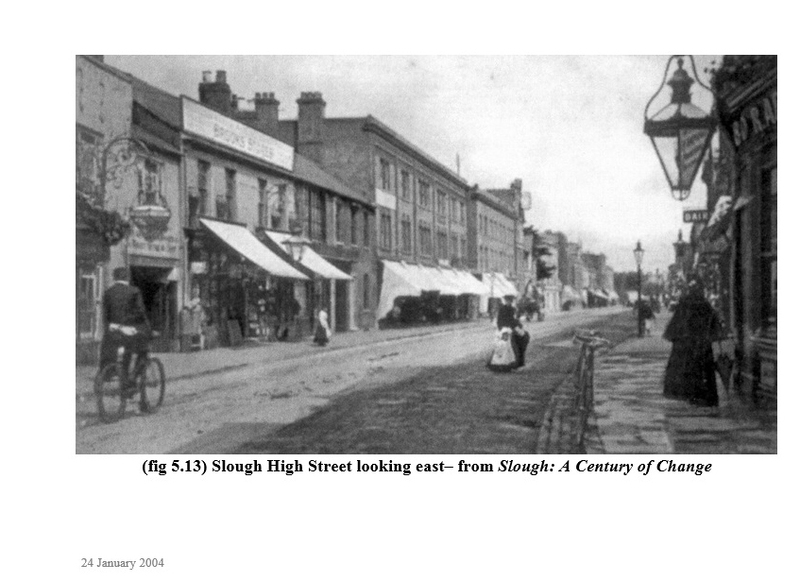 By 1911 the population of Slough had risen to 14,985 and the number of households to 3,580. New avenues of comfortable middle class residences spread out from either side of the main road on the eastern outskirts of the town. 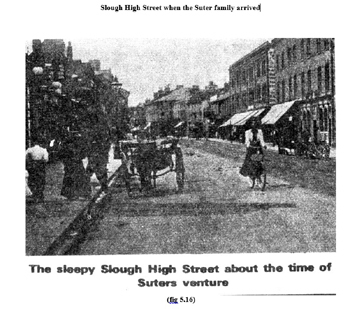 Lawyers, insurance brokers and other worthy 'somethings in the City' established their families in quiet and leafy Slough before departing each day by train for London. Growth continued steadily until the Great War and then came the development which led to the transformation of Slough from a quiet suburb to the industrial town which brought hope to thousands during the depression and despair to John Betjeman. It was during the final years of the war that the War Office acquired by compulsory purchase 600 acres of Cippenham Court Farm to the west of the town. By 1918, the cornfields had replaced by a vast motor repair depot, known locally as 'the Dump'. It received, and where possible repaired, large numbers of surplus military vehicles recalled from all over the World, as the war ended. By 1920, the War Office had decided to rid itself of this particular 'asset' and the entire depot and its contents were sold to the Slough Trading Company and Mr Noel Mobbs was placed in charge of disposing of the vehicles. Up to 8,000 people became employed by the company - including nearly half the existing Slough population - - and within a few years all the vehicles had gone and the empty buildings were available for letting. 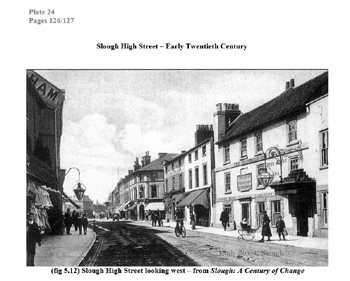 The Slough Trading Estate was founded in 1920 and in 1925 the Slough Trading Company Act authorised it to start work on laying out the estate with roads, drainage and water. Clarence, thus, arrived to have a look at a town the centre of which was almost painfully quiet. (Plate 25a fig 5.16 left) The population in 1921 had crept up by a further 1,500 or so to 16,397 in the 10 years from 1911. But on the outskirts the eyesore of 'the dump' was beginning to buzz gently with life and soon became converted into the Trading Estate. Clarence reported back to his father on what he had found including his assessment that the proprietor of Andrews & Son was used to a quiet life and now wanted to sell up. Father and son decided that they could do better. 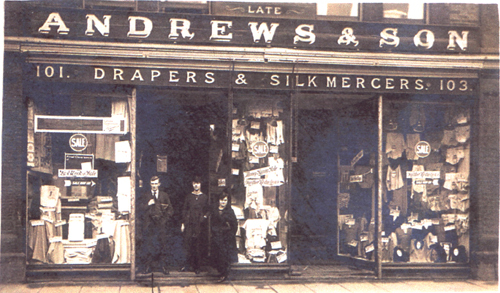 Andrews & Son had two shops in the High Street. The larger shop at Nos. 101 and 103 included 1,428 square feet of space in the shop on the ground floor and extensive living accommodation and room for storage on the upper floors. The smaller shop was at 104 High Street on the other side of the road. 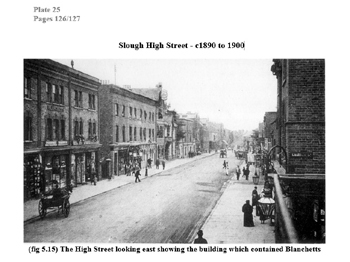 A regular 'mast head' advertisement was placed each week on the front page of the Slough, Eton & Windsor Observer either side of the papers 'title' shows the address of both shops. On Saturday, May 31st 1919 they are described as 'General Drapers, Milliners, etc' and their 'Special Whitsun Show' offered 'New Gloves, New Hosiery, New Curtains, New Muslin's, New Blouses, New Jumpers, New Robes and New Millinery'. 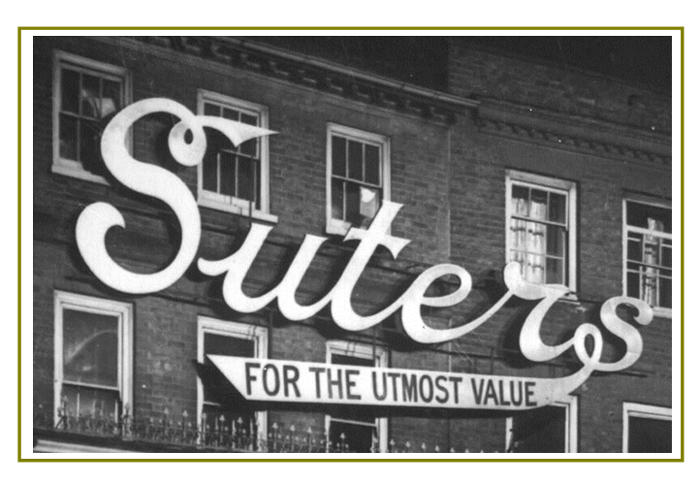 (fig 5.17 above) These advertisements ceased a week or so before the Suter take-over and were not continued by the new management. According to Tom Suter's information the smaller of the two shops was owned Dodds & Son, coal merchants in Slough but it nevertheless features in the advertisements. The Partnership Agreement between George William and Clarence commenced on the 22nd Sept 1920 which was a Wednesday and Clarence took over the lease of the shop in the afternoon of that day. The house above the shop was, presumably, either still occupied by the former owner and his family or uninhabitable as Clarence had to sleep in the shop. He, also, had no-one to cook for him but, was in luck in that he discovered Lidstone's restaurant further down the High Street and started to go there for his evening meal. 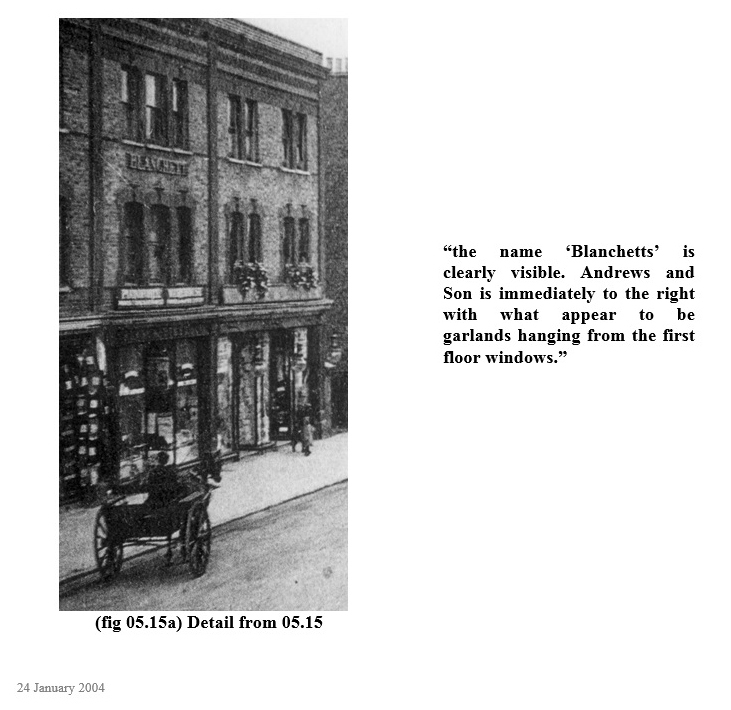 A photo of Lidstone's at 154 High Street is contained in Slough - A Century of Change (fig 5.18) A small diary kept by Clarence in 1920 has survived in the possession of Tom Suter. 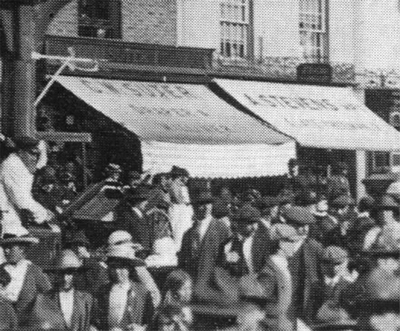 Early photos show the new Suter & Son shop under the sign 'Late Andrews & Son' with Clarence standing in the doorway with two female assistants in 1921. (fig 5.19 above) There were, in fact, six at this time - all women - the first man was not employed until 1925. As soon as the house above the shop was ready, George William joined Clarence and those of the family who were living at home moved to Slough from Ledbury enabling Bank House to be, finally, sold. Auction Particulars had been prepared for a sale by auction of Bank House in November 1919 but John Suter's 'memoir' confirms that family moved back following the sale of the business in Southgate and moved again from Bank House to Slough in 1920. At this time 'the family' consisted of George William, Elizabeth, Clarence and John (during school holidays). There is no mention of Winifred and it is likely that she was still living away from home as were Arthur and Frank. The house over (and possibly behind) the larger of the two shop almost certainly contained at least four large bedrooms one of which was soon occupied by two new "assistants". The elder was Maud, then aged 22, who moved from Friern Barnett to help Clarence develop the new family business. 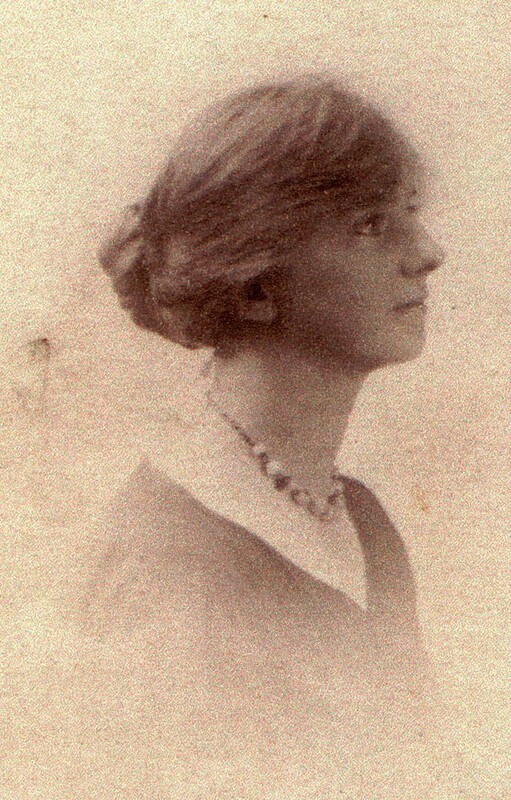 She took charge of the smaller shop at 104 High Street and shared a room with Jessie Bill who was Elizabeth Suter's niece. 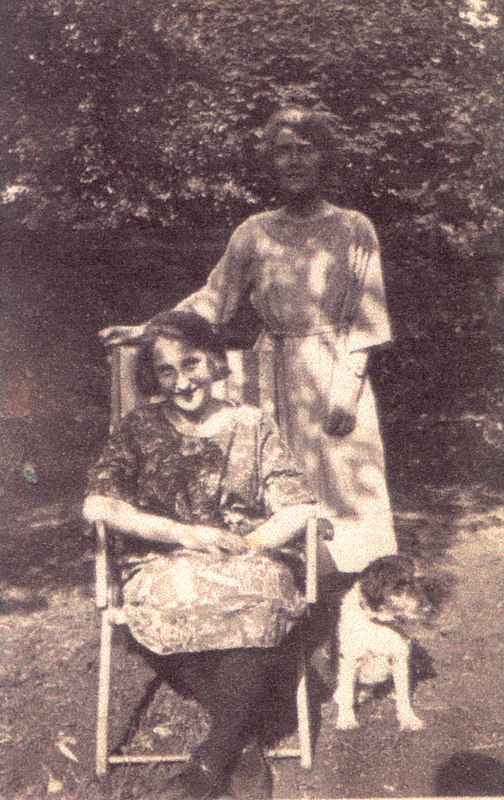 Jessie, then aged 14, was the third child of Elizabeth's sister Sarah Ellen (Auntie Sally) and Ernest Edward Bill. She had expressed willingness to do shop work and had been sent up from Ledbury by her parents to be 'under the eye' of her aunt and uncle. 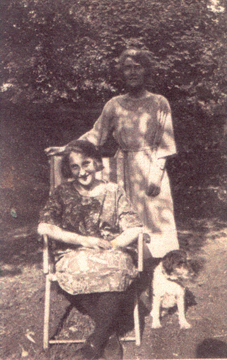 There is a photo of Maud and Jessie taken in 1922 (fig 5.20 above). The comment that their room was on 'the second floor' is interesting as the photograph in fig 5.21 (probably taken after Arthur and Frank joined the firm (hence the name 'Suter & Sons') and the family had moved to 'Kingsway') shows curtains at the windows on the 'first' but not the 'second' floor. Another shop in another town? 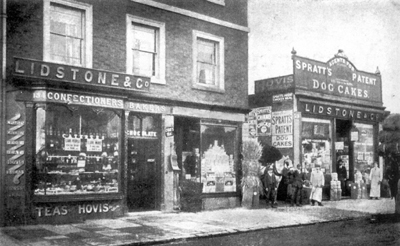 By the end of 1923 George William and Clarence had established a father and son partnership business with two shops on opposite sides of Slough High Street. 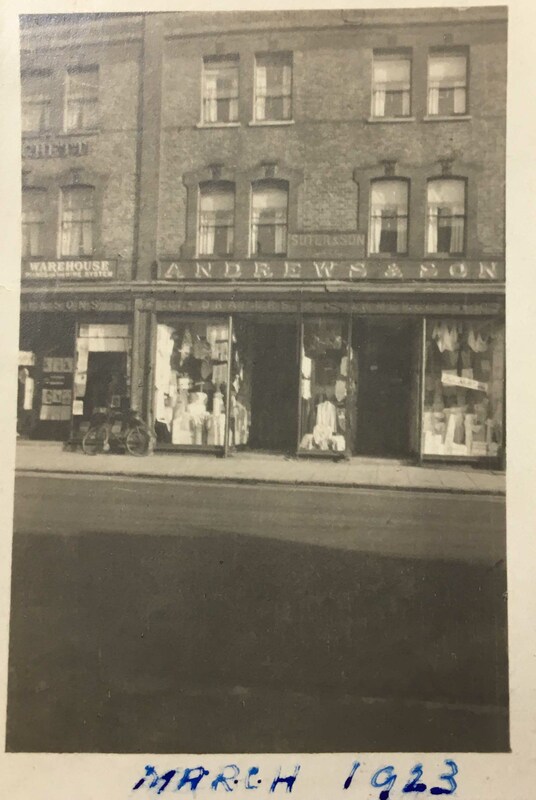 Clarence effectively managed the original 'Andrews & Son' shop at 101 - 103 High Street and Maud Beavis had been appointed manager of the shop on the other side of the road at 104. George William divided his time between the shops and felt sufficiently settled to take his family out of the upstairs flat into a new house in the leafy and distinctly middle class Hempson Avenue on the eastern outskirts of the town. One might have expected George William and Clarence to have paused at this stage in order to test out the profitability of their new shops but instead they must already have been casting around for another compatible business. According to its signboard Andrews & Son were drapers and silk-merchants. In other words they could be expected to sell cloth by the yard and garments made from cloth including silk. Both can be seen in the shop window display for the 'Sale' in the photo . (fig 5.19). The shop at 104 High Street is likely to have supplemented rather than duplicated the goods sold at 101 -103. In Ledbury George William had also sold ladies hats. The search did not take them very long. 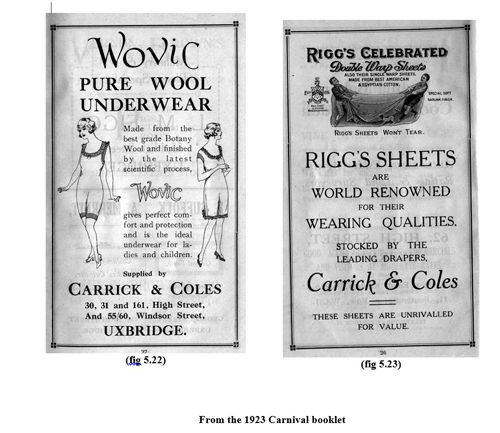 The partners were taking an interest in the Uxbridge Carnival week in 1923. They bought a copy of the booklet published by the Publicity Committee and doubtless met some of the members who included William Coad who was the proprietor of one of the two leading drapery stores in the town and Ernest Aldridge who was a partner in the other, a firm called Carrick & Coles. Talks must have started with Mr Aldridge and his partners and by the following year George William - prompted by Elizabeth - invited his two other adult sons to join an enlarged firm the name of which was changed to 'Suter & Sons'. The same invitation does not appear to have been extended to Winifred and female members of the family from executive positions in the firm and the company which succeeded it. I am certain that the enterprise shown by those now interested in the development of the Town will meet with every success. 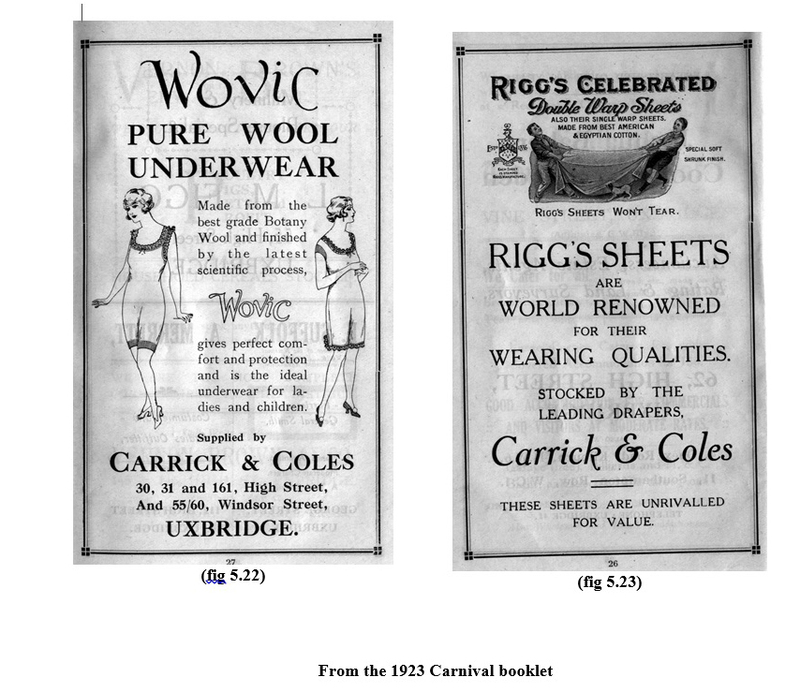 - H.M. Knight J.P. - Foreword to 1923 Uxbridge Carnival booklet. George William Suter and his sons agreed.